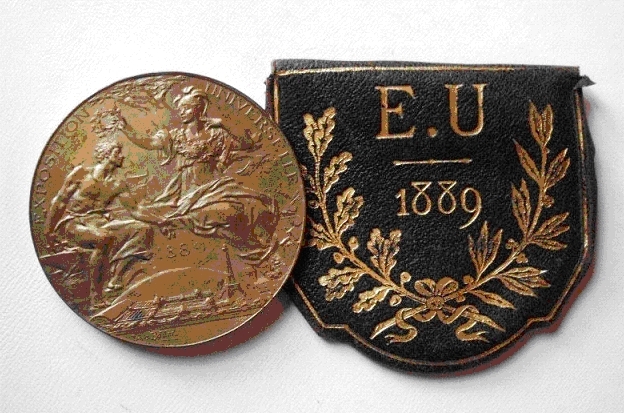 The Exposition Universelle of 1889 provided thousands of reasons to create medals. Many of the artists achieved the highest public regard for both their glyptic skills and for creating very elaborate decorative items and jewelery, like René Lalique. Exposition winners received personally engraved medals, as seen by the one here created by Prix de Rome medallist, Louis Bottée, awarded to the metalworking enterprise Hurtu. Fame is seated on a branch blowing a trumpet, while the obverse reveals the layout of the exposition and the Eiffel tower. Its little leather case is original and is so cute that it makes me want to carry it in my pocket! The smaller “Souvenir de L’Ascension” medal, either purchased or awarded to visitors arriving at the highest stage of the Eiffel Tower, is engraved by A. Charpentier. The 1889 date has been rubbed to a ghost, but the muscles in the worker’s back are clearly defined. The obverse has a view looking down on the top of the Tower’s peak, most likely a view from observed from an air balloon. And Daniel Dupuis’ medal, so beautiful in its graceful rendering of La Republic Francaise, is testament to the Renaissance techniques the artists studied so well in Rome and Paris. Bottée and Dupuis were both recipients of the coveted Prix de Rome, a scholarship awarded by the French government to artists wishing to study in Rome. The Library has put together a small display of these items in the Reference reading room, along with post cards of the Exposition Universelle and the Eiffel Tower. Come and see the last little bits of the exposition before Gauguin: Paris 1889 closes, and the Café des Arts moves on to Amsterdam.